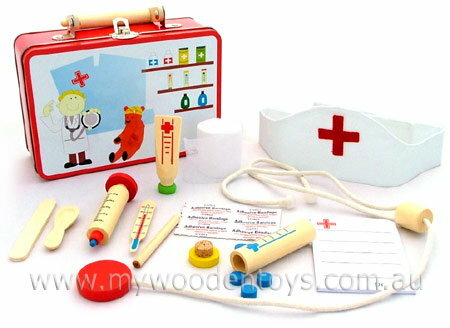 Doctor Tin Suitcase Nursing Set is packed full of all the essentials you will need to make your daily hospital rounds. Pill pot with cork top and blue wooden pills. This is a superb toy which encourages active play and a great little tin case to keep everything together. The wooden pill pot with blue pills is a wonderful addition. We like this because: "Really well thought through toy and the real band aids and gauze are a great touch"